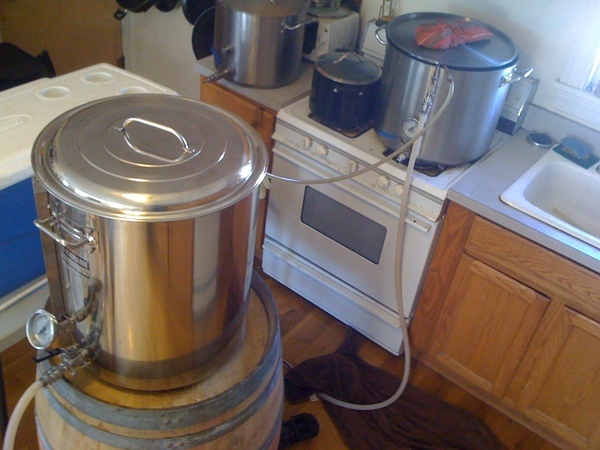 Well, it went off pretty damn well: we brewed 60 gallons of beer last weekend. In my last post, I vaguely described the setup. I’ll give it in more details here, with photos. These were both taken during the mash, when we had the pump going. You can see it on the floor in the 2nd photo (next to the towel). The way we organized our brewday was like this: we mashed 30 gallons in two vessels – our old mash tun and our new Blichmann pot. Each one can hold about 40 pounds of grain. We mashed 40 in each, yielding 36 gallons of wort, which we boiled in two batches of 18 gallons, yielding a bit over 15 gallons post-boil. Doing four mashes and four boils got us 60 gallons of beer. We are fermenting it in twelve 6-gallon Better Bottles. The pump was really useful. 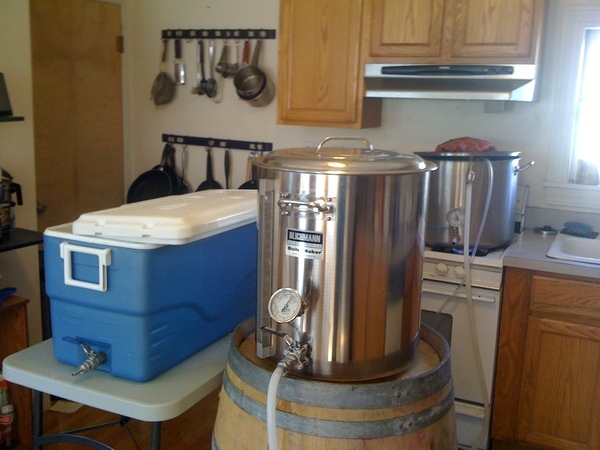 We used it during the mash to recirculate the wort through our hot liquor tank and maintain temperature. It worked – well enough, at least. The difficulty was that we undershot our extraction efficiency in the Blichmann, by quite a lot. We expected to hit 90 percent. We hit 77 percent. I have a few candidate explanations: poor water quality (we don’t measure the pH at all); not enough water/grain ratio during the mash & sparge; or wasted wort at the end of the mash. I am still trying to figure it out.